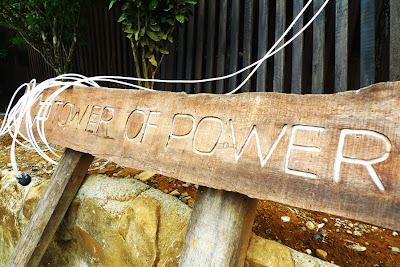 There I was standing in the middle of the airport, with music beating candy into my ears, bags packed and slung over my shoulder, ticket secured and stamped… and I had no idea what I was going to do in Cagayan de Oro. On the plane I studied the two-paragraph article on Cagayan de Oro in the in-flight magazine with utmost concentration. “Magic Carpet Ride” played endlessly in my head. 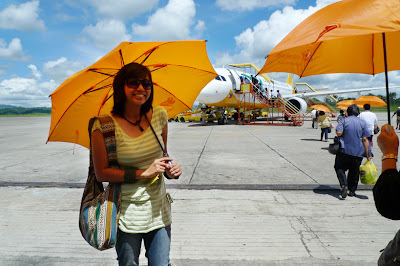 Ah, but at least I knew what I was going to do once I touched down at the Cagayan de Oro airport. Step 1: Get the bags from the conveyer belt. Step 2: Meet our Cagayan de Oro hosts at the parking lot. Give them our bags. 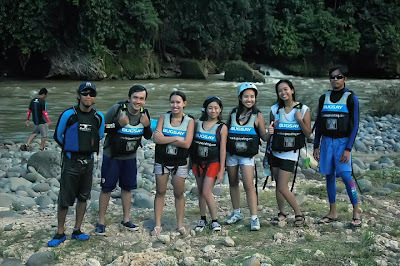 Step 3: Embark the jeepney that will take us WHITE WATER RAFTING, baby! 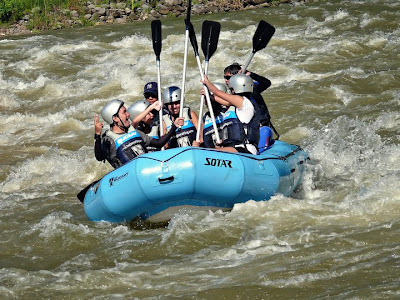 Truth be told, I was a bit nervous about white water rafting. I’ve been looking forward to this for months, but I was still nervously giddily excited. 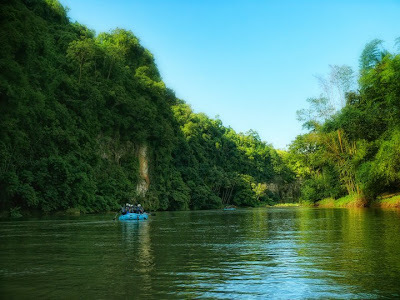 As we pulled over at Cagayan River and started getting into our rafting gear, “Test Drive” from How to Train Your Dragon automatically popped into my head, never mind that it was written for aerial flight. I, of course, got into the front seat of the boat. When the first bubbling waters appeared, we gripped our paddles, locked our feet, and pumped ourselves up for awesomeness. BAM! BAM! BAM! BAM!!! We’ve only been in the boat for a couple of minutes and we were already whooping!!! Until our guide told us that that bubbling water wasn’t even a rapid yet. It was just…bubbling water. Ahahaha! Eventually, we saw what a real rapid looked like. Perfect track for this? Machinehead by Bush. After that it was three hours of more awesomeness. 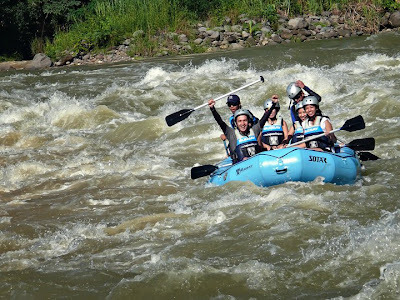 True, maybe the rapids weren’t as extreme as the ones you can see in, say, River Wild, but, hey. White water rapids are still white water rapids. Especially when you’re standing up. 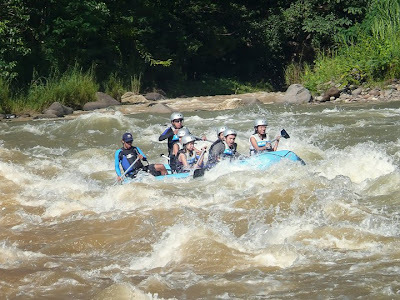 I LOVE THE STANDING RAPIDS! 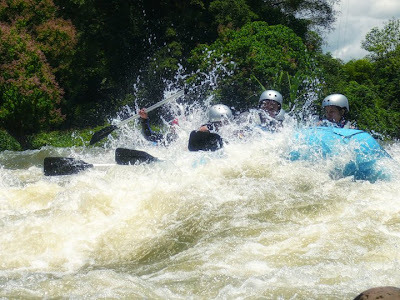 The lessened stability heightened the thrill even more, yanking these rapids into the top of my favorite experiences ever. In between the rapids there were a couple of minutes of tranquil still waters so we could take a swim and appreciate the beautiful scenery. But when it was go time, IT WAS GO TIME. Awesome, awesome experience. 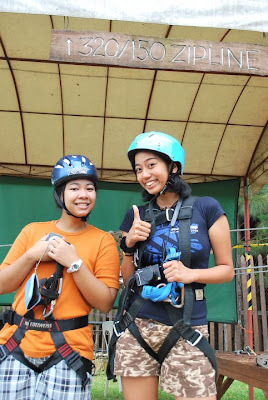 I want to come back and do it again, on rainy season, please! BUGSAY! After that morning (and afternoon), we finally checked into our hotel to change. And then it’s off to Victory Cagayan de Oro for Youth Service. It’s always great to visit our churches in other locations, and it was especially fun to see the energetic CDO young’uns. And then a quick night out at Night Cafe before going back to the hotel to finally try out the bed. My body was dead tired, but my brain was still on a high, so I plugged in some Jack Johnson to get me relaxing. “Tomorrow Morning Comes” was the last song I remembered listening to. Jack Johnson was set on repeat play, so when I woke up the next morning, his tunes were still in my ears. I couldn’t help a lazy smile when I woke up to “Better Together”. The morning saw me just lazing around and dragging myself out of bed five minutes before they stopped serving breakfast in the lounge. And then after breakfast I crawled into bed again before I absolutely had to get up to get dressed for the wedding. 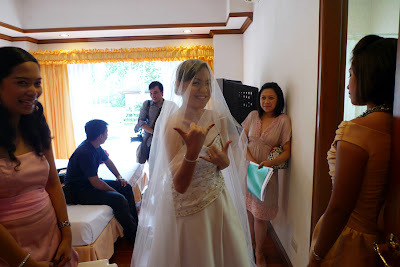 After getting dressed (and also being my friends’ fashion consultant) I went to the bride’s suite. Estela, if you’re reading this, I’m sure you already know this, but I’ll say it anyway. YOU ARE BEAUTIFUL. I mean, like, WOW. 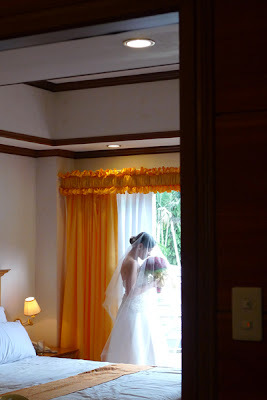 I sneaked in some shots while Joppet did his thing, before slipping out to help check on the maid of honor. 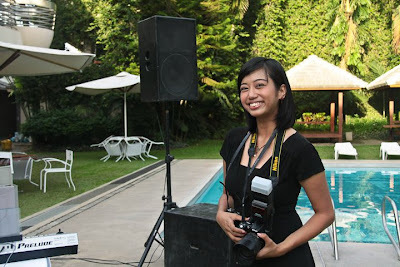 Although I already planned to help out, I did more work than I was prepared for; I was asked to do the bridesmaids’ work! Haha! But it was okay. I had fun doing it. During the ceremony, though, I dropped the bridesmaid’s hat and switched to photographer mode, since Joppet asked me beforehand to help him out. Again, I had so much fun doing it! And then I switched to bridesmaid mode again for the reception, before finally sitting down to actually be a guest. Okay, let’s face it, I enjoy working behind the scenes. Haha! The actual wedding was beautiful, funny, and completely heart-warming. There’s so much to say about the wedding, but I think I’ll save that for later. 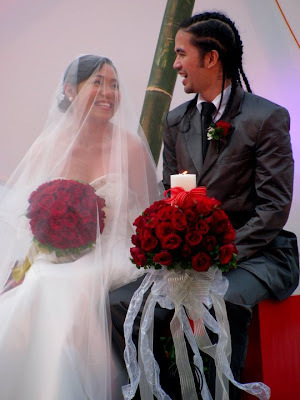 One thing I can say: when Cocoy and Estela danced to “Iris”, another song was playing in my head. Congratulations, Cox and Este. I love you guys! Day 3. Again: Itinerary? What itinerary? 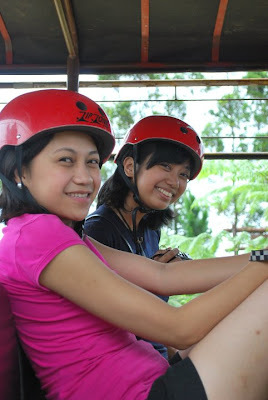 A couple of friends suggested after the wedding that we go to Bukidnon for food, zipline, and who knows what else. My answer was, not surprisingly, “GAME!” I woke up early for an early breakfast and early bonding with Seneca, a friend I haven’t seen for more than a year. Miss you, Sen! 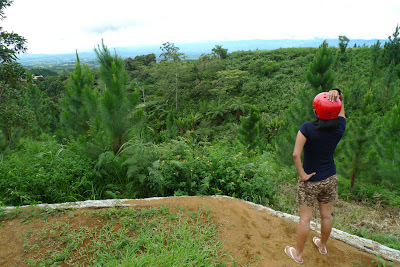 A couple of hours later, we were on the road to Bukidnon for ziplining! First up was the 320/150 Zipline. It was short but still fun nonetheless. For me it was the time to test out camera settings. And shot feasibility. Haha! Harness, check. Helmet, check. Camera, check! 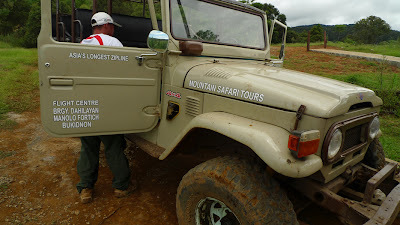 After that it was get on this badass 4×4 jeep for a wild ride up the mountain for the 800++ km track. 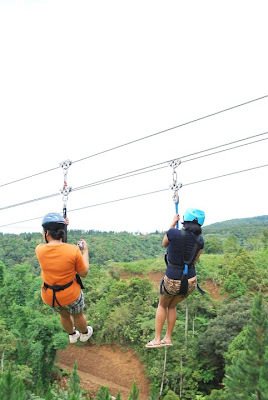 ZIPLINING ROCKS. I have no more words. And, by the way: this has nothing to do with my post, but IT MUST BE POSTED. We had lunch at the Del Monte country club. 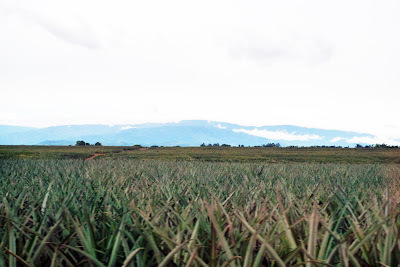 There be endless fields of pineapples. And then it’s back to Cagayan de Oro. 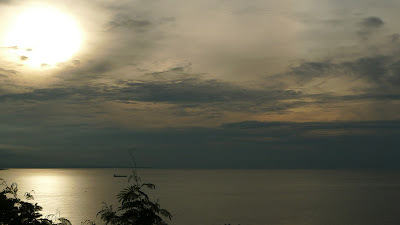 Beautiful sunset at the Cagayan de Oro bay. When everyone else in the van dozed off (except for Job, of course, who was driving) that feeling came. You know that feeling, right? It’s the one you get near the end of an awesome trip. It’s the one that you get when you realize that you are, indeed, near the end of the trip. It’s the one that makes you wish that your trip was longer. It’s the one that made me put “Breakdown” on repeat play, from the trip back to Cagayan de Oro City until I went to bed that night. For an almost completely unplanned trip, mine was packed. But although my trip was packed, there were many things I wasn’t able to do. I didn’t get to roam around the city, for one. 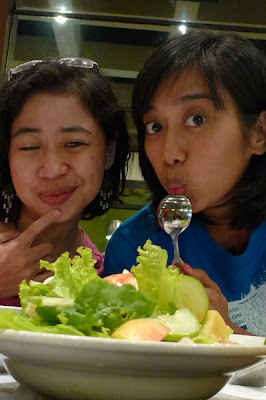 I wasn’t able to sample the food haunts that only locals knew about. I wasn’t even able to visit the market. Yep, this is the part when I say: I AM COMING BACK TO THIS AWESOME PLACE.